« Who thought up this product name? Everyday, I drive from my home in the suburbs of Northern Virginia to my office just inside the Beltway. How ironic that my commute is exactly 26.2 miles from my driveway to my parking spot at work; 26.2 miles being the exact distance of a ‘Marathon’. So each day, I get in my car with my cup of coffee and begin my trek with the hundreds of thousands of other commuters on the roads here in the Washington, DC area. 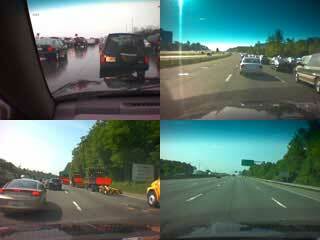 As you can see from the first picture, I’m usually stuck in bumper-to-bumper traffic. I swear I get some sort of a tan from exposure to all those red brake lights in front of me. Then, I get to look at the wide-open HOV (High-Occupancy Vehicle) lane on the left side of the road. Why don’t I commute with other people you ask? Well, I have a weird schedule so some days I need to be in early, other days a little later. So, the law-abiding driver that I am, I stay out of the HOV lane. Of course, that doesn’t stop hundreds of other drivers who are alone in their car. From my informal statistics that I gather everyday while stuck in traffic, I can safely say that approximately 60% of the cars in that lane are breaking the law. I love it when politicians keep saying “HOV lanes work! Let’s add more!”. Sure, they work, if you ENFORCE them! And when traffic starts to get better, I get to deal with the incessant construction being conducted on most roads here. As you can see in the picture on the bottom-left, Virginia DOT just loves to block half the lanes of the Beltway during rush-hour. What was so important as to block traffic during such a busy time of day? When I passed the last truck, I found a small pickup stopped in the middle of the lane. A man with a small bucket of tar was taking his time ‘sealing’ small cracks in the asphalt. They couldn’t have done this during the night? Or maybe mid-day when traffic is a little less heavy? Every once in a while, I’ll get lucky though. Maybe all the planets get aligned and there’s a perfect wind or something, but I’ll reach a point in my commute when the road is entirely clear, as you can see in the last picture. THAT is what I want to see each morning and evening during my commute. Think there’s a lot of traffic where you live? Come to the Washington, DC area for a couple days and drive around during rush-hour. I’m sure you’ll change your mind rather quickly. This entry was posted on May 25, 2004, 1:39 pm and is filed under Blogs, Fun. You can follow any responses to this entry through RSS 2.0. You can skip to the end and leave a response. Pinging is currently not allowed. Move to Ashburn, he said. Commute is fine, he said. Not much traffic, he said!